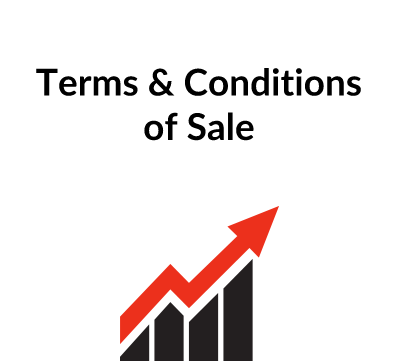 These Terms & Conditions are for use by traders selling goods on the internet. 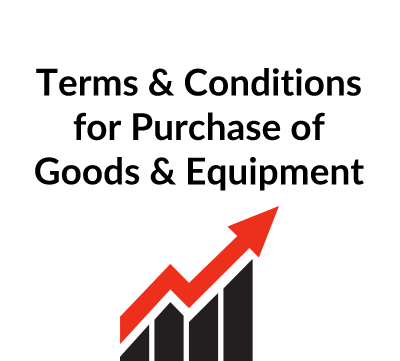 This contract template is for businesses trading over the internet and are to be displayed on your website. It takes account of current consumer contract regulations. It allows you to offer customers high quality policy procedures for online ordering and sales, and it protects you by helping to ensure you meet online trading regulations. 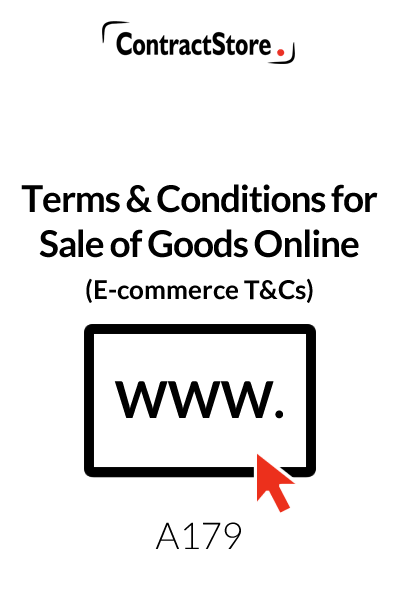 These terms and conditions for the sale of goods online should be displayed on the website where goods are being sold. They are written primarily for a business that is selling to consumers rather than b2b and they are designed to comply with the latest Consumer Regulations as at June 2013. The terms and conditions should be easily accessible by visitors to the website. In addition, a customer who wishes to purchase goods online, using a credit card or some other payment method, should be required to confirm that he/she acknowledges that placing an order implies an obligation to pay. Also the customer should confirm that he/she has read the terms and conditions and accepted them before proceeding to the checkout. In order to have evidence that the customer is aware of the terms on which goods are sold, the usual system is to have a ‘tick box’ which must be ticked by the customer confirming that the terms and conditions have been read before the sale process can be concluded. In the case of consumer contracts, clearly written, easily accessible terms are important. The sale of goods online is subject to quite a lot of regulation, especially in the case of consumer contracts. The Consumer Rights Act 2015 sets out the rights of consumers when buying goods, services or digital products. There are summaries of the key points on our Blog. he key features of the Consumer Contracts (Information, Cancellation and Additional Charges) Regulations 2013 are summarised in a note on our website that you can download free of charge –document Z171. It is important to provide on your website all the information required by the Regulations as failure to do so can mean the contract is no binding on the consumer. Please note: Our Terms & Conditions contain some blanks and some wording in italics and/or square brackets. You should be sure to replace these with relevant information before you publish your Terms & Conditions. You also need to go through the Terms and change anything that does not apply to your business. The name of the company selling goods should be inserted as indicated. Also, you must identify clearly the “Goods” which are being sold. 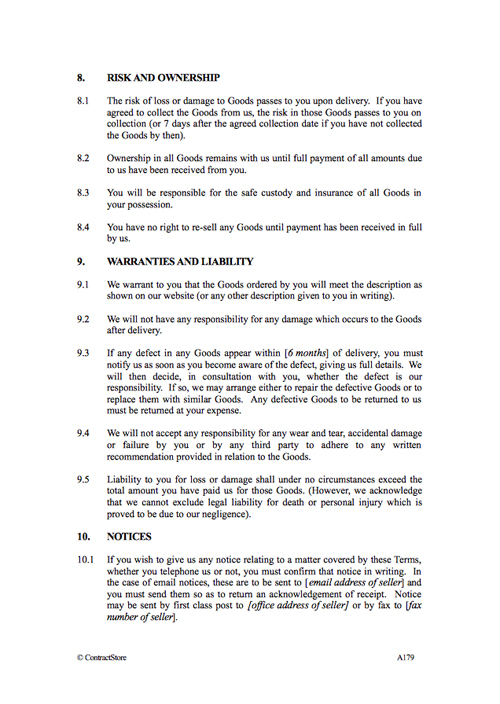 Clause 1.2 is designed to make it clear that the seller’s terms and conditions will take precedence: online sellers do not have too much of a problem here but in other situations, a purchaser may confirm that he wishes to buy on his own terms and conditions and an argument can then develop as to whose terms and conditions actually apply to the contract – this is known as the “battle of the forms”. It is a legal requirement that the total price of the goods, including taxes and any other charges are clearly shown. The wording in clause 2.2 is designed to reflect this but it may have to be adjusted depending on what information is provided on the website. In clause 3.1 the customer is required to “warrant” that the information that he provides when he purchasing is accurate – this is intended to protect the seller against credit card fraud, although in practice this can be difficult. Clause 3.2 attempts to deal with this problem in another way: when a credit or debit card payment is made online, it sometimes happens that the details provided to the company processing the payment do not fully match the details held by the customer’s bank. In spite of this, the banks will sometimes allow the payment to proceed. A discrepancy will usually be highlighted by the company processing the payment and this will then enable the seller to make some further enquiries before dispatch of goods. Worldpay, for example, notifies the seller with a ‘Caution’ or a ‘Warning’ depending on the perceived level of risk. Clause 3.3 is designed to give the seller some protection if there is any technical error which arises. The Data Protection Act controls what people can do with information which is provided to them. The wording of this clause may need to be amended if, for example, the seller is intending to supply lists of customers to a third party, then the consent of the customer should be obtained. This is reasonably self-explanatory and makes it clear that, whatever method of payment is used, payment must be received in full before the goods are dispatched. This again can give protection if a credit card payment is cancelled. It is possible that the delivery date will be specified on the website but if not, it should be provided by the seller and since deliveries cannot always be guaranteed, clause 6.1 is intended to give the seller some protection. Unless otherwise stated in the terms, delivery should be within 30 days. Clause 6.3 requires the customer to give prompt notice if the goods arrived in a damaged state. There are, as mentioned, numerous regulations with regard to “distance selling” whereby a customer has the right to cancel an order within 14 days from the date he/she receives the goods and to receive a full refund from the trader within 14 days. This clause largely follows the wording recommended in the Regulations and it includes a reference to the Model Cancellation Form in Schedule 3 of the Regulations. A copy is attached to these notes. Use of the model form is not compulsory and you may refer to have a cancellation form on your website. 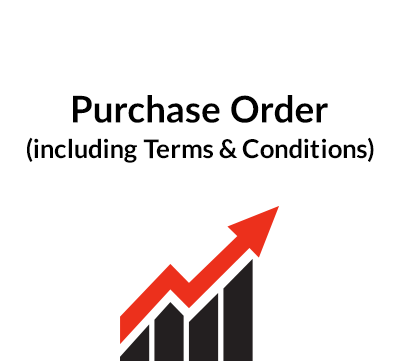 The seller is entitled to impose certain cancellation charges on the customer and this is covered by clauses 7.2 and 7.3. Under the Regulations, goods which have been personalised for the customer or which have been made to the customer’s specification are excluded from the cancellation provisions and this is made clear by clause 7.8. In the case of digital content, when the content is delivered online once payment has been made, rather than after 14 days, the terms need to be revised to make it clear that the customer consents to early delivery and agrees to waive the 14 day cancellation rights. Once the goods are delivered to the customer, the customer becomes responsible for loss or damage. The Regulations refer to a consumer acquiring ‘physical possession’ of the goods. Clause 8.1 also allows for the risk to pass to the customer if there is an arrangement whereby the customer agrees to collect the goods. Under clause 8.2, the seller retains ownership until all payments have been received – this gives the seller the right to recover the goods if they are delivered before full payment has been received. Under the general law there are implied warranties on the part of the seller – that the goods which he is selling will meet the description and that they will be reasonably fit for the purposes for which they are required etc. This clause contains a fairly basic warranty on behalf of the seller. Under clause 9.3, the seller in effect offers a guarantee that if within a specified period any defect in the goods appears, then the seller will either repair or replace those goods, but the cost of return is at the customer’s expense. Clauses 9.4 and 9.5 are designed to limit the seller’s liability. Here again there are laws designed to protect the purchaser and the seller should check the legal position. Whenever a claim arises, it is sensible to have a formal method of giving notices and that is dealt with here. If goods are being sold online, it may be logical for e-mail notices to be accepted but the seller might prefer to have a more traditional method of notice – e.g. by fax or post. This clause sets out grounds on which the seller has the right to cancel the contract and recover possession of any goods which might have been delivered. Certain unforeseen circumstances beyond the control of the parties might prevent the seller from making a delivery in accordance with the terms and this is covered here. The seller can cancel or suspend the contract in those circumstances. There are some fairly standard clauses known as ‘boiler plate’ clauses which lawyers like to see in agreements of this type and some of them are set out here. Where goods which are sold are subject to Intellectual Property rights – e.g. a work of art or a piece of sculpture, sale of the goods does not give unlimited freedom to the purchaser: copying a work of art and then selling it would require the consent of the artist. If there is a problem that cannot be resolved amicably, this clause allows for the possibility of mediation and, failing that, a dispute will be referred to the English courts. Mediation is a process where an independent third party endeavours in an informal meeting to resolve a dispute and it is a lot cheaper than the court processes. See our free documents for more information on Dispute Resolution. Since the contract is written with English law in mind, this is the law which governs the contract.